ScreenUpdating Application Property in VBA is used to turn ON/OFF screen updating. If we set ScreenUpdating property to TRUE then it turns on the screen updating else turn off the screen updating. When we set ScreenUpdating property of an application object to false then it will speed up the macro. It’s one of the optimizing technic. Here syntax for ScreenUpdating Property of application object in VBA. Where ScreenUpdating as Boolean datatype. In the above syntax Application represents object and ScreenUpdating is the Property of Application object. Please find the below example for ScreenUpdating Property of an application object in excel VBA. Explanation: In the above example, it will display numbers from 1 to 100 in the first column on Sheet1. We can notice the screen updating while updating Sheet1. 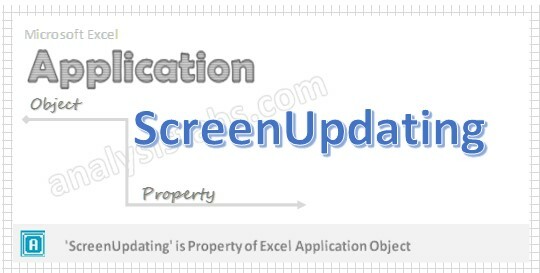 Please find the below example for ScreenUpdating Property of application object in excel VBA. Explanation: In the above example, it will display numbers from 1 to 100 in the first column on Sheet1. We can observe that there is no screen updating till running the macro. Don’t forget to reset the ScreenUpdating valsue as TRUE at the end of the macro. Step 5: Now press F5 to execute the code and observe when ScreenUpdating is ON and OFF.